Originally a young boy's pets, four turtles were lost in the sewers when a canister of glowing ooze smashed their terrarium. The four ooze-covered turtles were rescued by a kindly rat, and all five were affected by the substance, becoming more human by the day. The rat, Splinter, was the former pet of a ninja master, and he trained his newfound charges in ninjitsu, giving them names from a book he had found. Together, the four brothers became a force for good in New York City, as the Teenage Mutant Ninja Turtles! 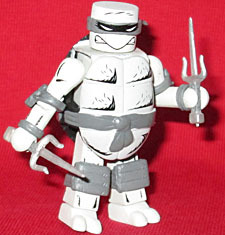 I didn't even know there were TMNT Minimates until Rustin found some, and by that point, it was too late to get any. So I was resigned to skipping the entire line, until this Mirage Comics box set was announced for SDCC. The Turtles are painted completely in grayscale (of course, being Mirage, they'd all be wearing the same color anyway), so the only way to tell them apart is by their weapons. For instance, Raphael's sais, which are flatter than you'd expect; you'd think the handles would be round, not rectangular. He can hold them in his hands, or store them in the loops on his belt. Rather than only relying on the standard Minimate body to create the turtleiness of the boys, they get a new chest cap to create their shell, both front and back. All four use the same cap, with different belts glued into the back to hold their specific weapons. They also share a new head that seems to be two pieces with the bandana sandwiched in between, and two-toed feet that actually aren't reused from Nightcrawler: his feet were very square, while these are much rounder. Leonardo's swords are just as rectangular as the sais were, so maybe that's to accommodate the Minimate hand-shape. Both his scabbards point the same direction, so the swords' handguards bump. 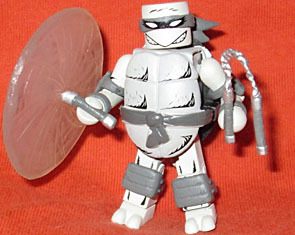 In addition to the heads and chest caps, the Turtles get new elbow- and kneepads, plus bands around their wrists. Like the Ghostbusters' elbow pads, it's hard to find a spot where they look both right and still allow the arms to bend, and the kneepads want to fall all the way down to the ankles. You can tell, by the way the leg muscles are painted, where the pad is supposed to rest, but it has trouble staying. Also, Donatello's weapon loop is weirdly designed: it's angled in such a way that his bo points away from his body, rather than staying close. If the belt didn't match the angle of the shell, we'd think it had been glued in upside down. 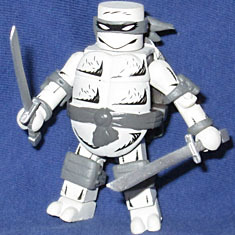 As we said, the Turtles are grayscale, not truly black and white like NECA's Turtles were - so the pads are grey, the shells are black, and the rest is mostly white. But the painted areas (the front of the shells) don't quite match up with the molded areas (the limbs). All four have the same details painted on the bodies, but they're differentiated by their expressions - look at Michelangelo, with his happy little smile, which looks nothing like Raph's grimmace. He not only gets two sets of normal nunchucks, he also gets two really cool "spinning" versions, like those Mjolnirs a few Thors have had. 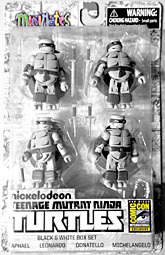 All four Turtles also come with display stands, which a lot of Minimates do but we usually ignore because who cares? It's not like many Minimates have trouble standing on their own, and for those that do, well, Minimates have had Lego-compatible holes in their feet for more than a decade. It's not really an issue. But in this case, it's completely welcome, because every base is painted to look like a manhole cover, perfect for characters who live in the sewer! These bases aren't some generic thing, they're character-specific, and thus a lot more fun. Also, it's only something that would work for the Turtles - how many other characters can you think of who would logically be standing on something round? 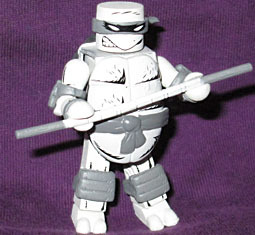 This entry was posted in Art Asylum, MMMR and tagged Minimates, TMNT. Bookmark the permalink. "Also, it's only something that would work for the Turtles - how many other characters can you think of who would logically be standing on something round?" There aren't any DC Minimates though. Write to DCD and tell them you want some!